Pressure cook the potatoes for 2-3 whistles. Remove from the heat and drain the water. Peel off the potatoes skin and dice into cubes. 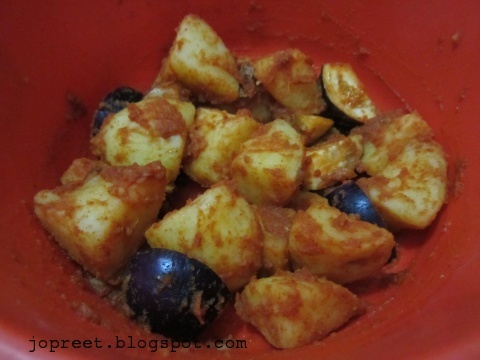 Marinate potato cubes and sliced brinjals with little ginger-garlic paste, red chili powder and salt for 30 mins. 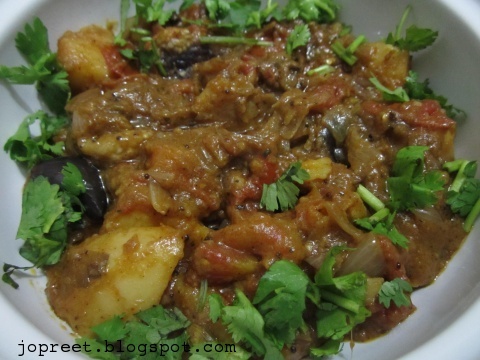 Heat oil in a pan or kadhai and fry the marinated vegetables till it turns light brown. Remove the vegetables and reserve the oil. Add mustard seeds, curry leaves, cardamom, cloves and cinnamon to it. Saute for a while and add chopped onions. Fry till it turns golden brown. Add remaining ginger-garlic paste and chopped tomatoes. Mash the tomatoes. Add fried vegetables, turmeric powder, red chili powder, coriander powder, pepper powder, asofoetida and salt. Fry for two mins. Add tamarind water and mix well. Add 1/2 cup water and cook it covered till the gravy thickens. 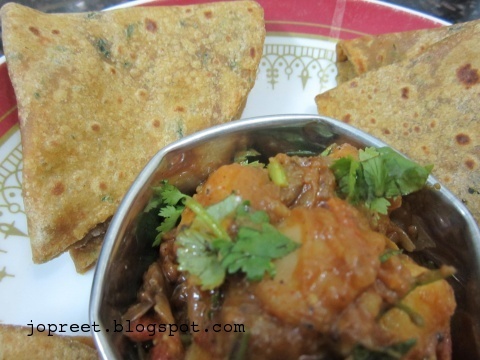 Garnish with chopped coriander and serve hot with roti. Like the colour of the curry. 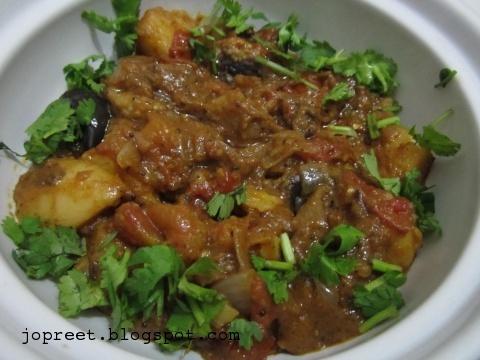 very yummy one…. Mouth watering…makes me hungry.Thanks a lot.